I am a college instructor, but travel to different campus locations. I have to carry multiple books and paperwork, along with my laptop with me all the time. 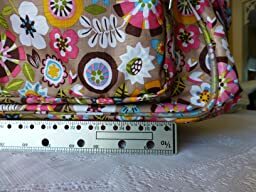 I have tried other bags and carts, but none could stand up long to the weight and abuse of my heavy use. 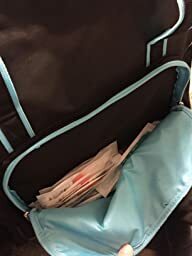 I have been using this tote for about 4 months now, and have not had any problems. It is pretty, just the right size for what I need, and the handle seems to be holding up well. 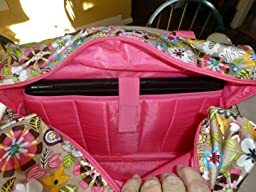 I love the front and side pockets for holding and organizing smaller objects. The sides are perfect for a couple soda cans in one and my laptop cord in the other. I also love the fact that I can easily lower the handle and use the hand straps to pick it up and put it in my car, which was a problem with some of the other styles I have tried. The wheels roll well and seem to be holding up well also. I really have no complaints! 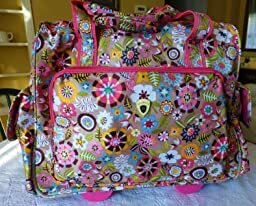 I bought this about 2 1/2 years ago for a trip I took to London and Paris because I wanted a carry on with rollers. I absolutely love the cheery color and pattern. The telescoping handle is easy to pull up and push down. It is big enough to hold my large size laptop as you can see in the photo. 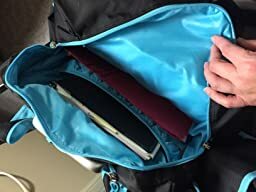 There are good sized side pockets on either side with Velcro closures and a very large zippered pocket in the front. I actually took this on the plane with me and kept it partly under my seat and legs. Some may find it a little large for on a plane, but it worked for me. I liked having access to my computer and other items during the flight. 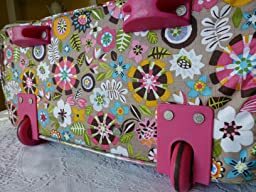 I’ve used this luggage many times over the last couple years and as you can see in my photos, it has worn quite well, practically looks like new! 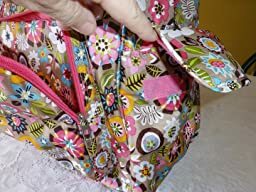 The handles and zippers are well made and have held up to my habit of over stuffing it! It’s easy to wipe clean, too. As you can see, I’m very happy with the look and function of this luggage. 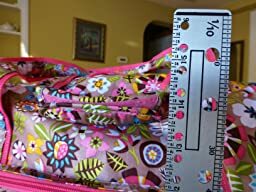 I suppose the only possible downside might be that it could be considered by some a bit large for a carry on, but I found it to be just fine. Strong, durable and able to carry a lot easily. 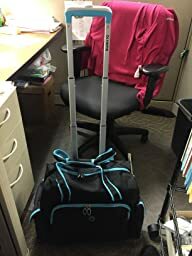 I’m a nurse and I use this to travel to the different practice offices to hold everything from stethoscopes and surgery books and patient results, along with any clinic supplies I always want handy. 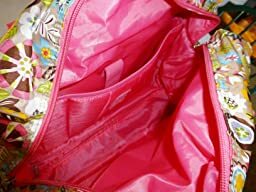 Plenty of pockets to organize, but not so much that it’s cluttered and difficult to remember where you put things. Strong handles to carry when you need to and an extending handle to roll when you want to. I can only imagine how helpful this would be for longer distance and business travels. A good size for computer/laptop though probably not the best if you’re planning on spending a couple of days or longer somewhere.